Vladimir was born in Moscow, in 1994. In 2001-2008 he went to Children’s Music School n.a. B.A. Tchaikovsky (class of Sergey Ostapenko, Honored Artist of Russia). Upon leaving the school in 2008, Vladimir continued his education in the class of the same teacher at the College of Music and Dramatic Arts. 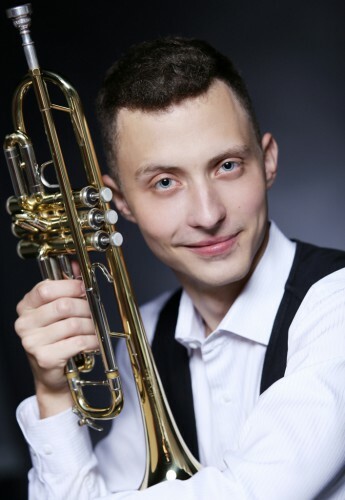 Since 2012, he has been a student of the Tchaikovsky Moscow State Conservatory (class of Vladislav Lavrik, winner of the international music competitions). 2013 – the 2nd Prize winner of the Musica Classica International Festival and Competition (Ruza). 2013 – the winner of the Merry Rainbow International Festival and Competition of Children’s and Youth Art (Odessa, the Ukraine). 2014 – the 1st Prize winner in the 2nd age group at the 3rd International Festival and Competition n.a. Savely Orlov (Samara). 2016 - the 1st Prize winner in the ХХI Tolyatti International Competition of musicians (wind and percussion) (Tolyatti). 2018 - winner of the "Northern Rhapsody" International Wind and Percussion Competition (Cherepovets). Laureate of the II Prize of the All-Russian Competition for Symphony Orchestra Performers (Moscow). International Charitable Foundation. Since 2008, Vladimir has been also a grant-holder of Vladimir Spivakov International Charitable Foundation. He took part in master classes of such famous musicians as Jens Lindemann, Wolfgang Guggenberger, Valery Posvalyuk, Vladimir Kafelnikov, Evgeny Guryev.